April 19, 2018 By Tina M 4 Comments This post may contain affiliate links. Read my disclosure policy here. 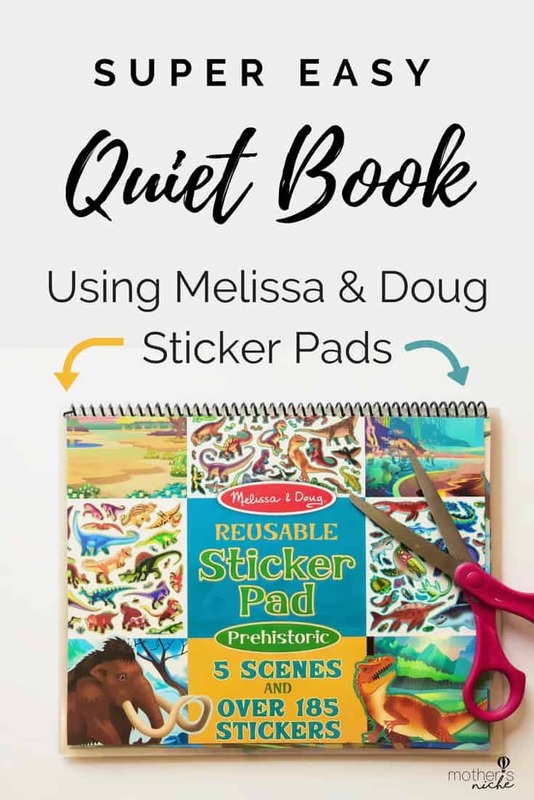 You guys….I have been meaning to make these sticker pad quiet books for over a year now and I finally did it. They were SO FAST and EASY to make! 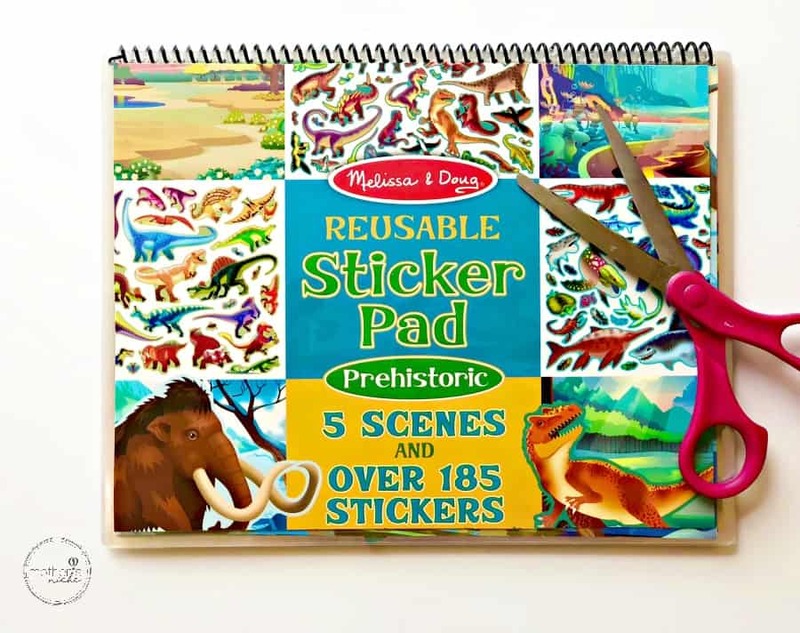 I really like the idea of the Melissa and Doug Sticker pads, but the pads fall apart too easily and the pages and stickers get lost, resulting in them being thrown away. If you prefer a quick video tutorial (don’t we all? ), you can skip the text instructions and watch the video I included below. By binding them into a little book, they now fit easily in the diaper bag and last through multiple kids and I LOVE them! Although you can get larger width laminating sheets, I like to cut the sticker pads down to regular paper size and use paper sized laminating pouches (3 Mil) because the book fits into the diaper bag better. We’ve even taken these sticker pads on plane rides, and the regular size is just too big for us. I love making the quiet book into standard 8.5 x 11 pages. Also, laminating is optional which makes this project even more fantastic…I just did it to make my books last a really long time. I want them to last through multiple kids, and laminators are really affordable these days. This brand of laminator is the one I am using in the video. 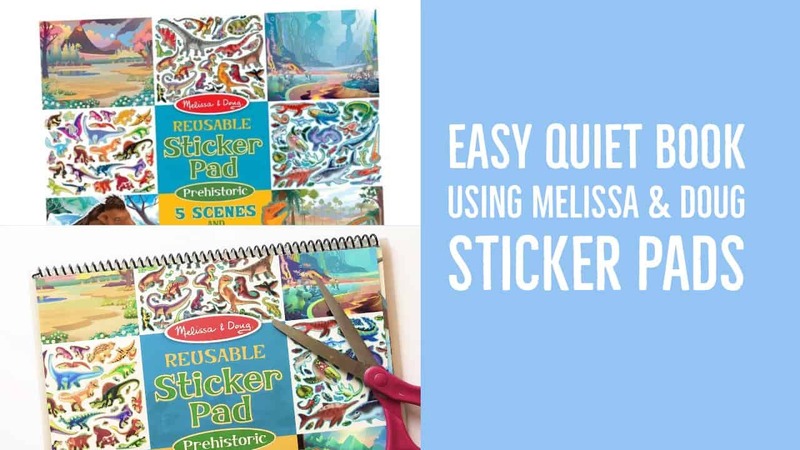 The funnest part about this project is that Melissa and Doug have many different versions of their sticker books, so you can easily make 5 of these in different themes, all in one day! I hope that video tutorial made the process super easy to understand. If you wanted to, you could combine multiple sticker pads into one large quiet book, but I like to swap out the different themes so that my kids have something “new” to look forward to in the Sunday bag each week. Swapping them out with the different themes keeps the Sticker Pad Quiet Book new, fun and exciting for the kids. I also love that this particular project is good for a wide range of ages. All 3 of my kids enjoy playing with these (ages 2,4, and 6). Don’t forget to add a few blank pages at the end of the book for storing stickers. Each pad comes with a bunch of stickers, so having a few pages to store them on at the end helps keep the stickers from getting lost.